The Min Pin (as it is affectionately called) originated in Germany and has been documented since the early 1800s, more formally so since 1895 with the formation of the German Pinscher Club. 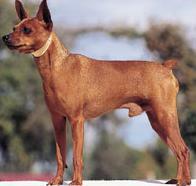 Evidence of the breed dates to the 15th Century and it was formerly known as the Red Pinscher that refers to the "small red deer", found in the German forest. 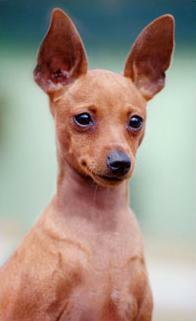 They were originally bred as stable dogs to eradicate rats and mice. This is a proud and spirited little dog - all terrier and certainly no "toy" - they are a loyal and intelligent companion. They are fearless, alert and make an excellent watchdog.